Vape HQ is a new shop located on High Street, Syston, selling vaping devices, e-liquids, starter kits and accessories. 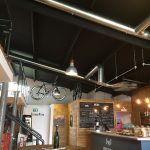 Shop owner, Gary Iley, required a cost-effective solution to heating and cooling the new premises in order to create a comfortable and inviting environment for both staff and customers, and delivering a clean finish in keeping with the shop’s look. Glenfield Group was asked to complete a survey and provide a quote for Vape HQ, which needed a new heating and air conditioning system installing. As well as providing a compact and efficient unit to fit with the premise’s new look, Glenfield Group was required to complete the installation in a timely manner, ensuring it would meet the deadline of the shop’s opening, without damaging any of the shop fitting that had already been completed. A white LG wall-mounted system was installed to meet all of the client’s requirements. Gary, who also owns Leicester-based specialist signs manufacturing firm, Sygnet Signs, comments: “Darren had completed a number of installations for me previously at Sygnet Signs, within both the offices and factory, so I was keen for him to complete the work at Vape HQ.